The hot summers and mild winters of Georgia make it a popular habitat for a large number of snakes. 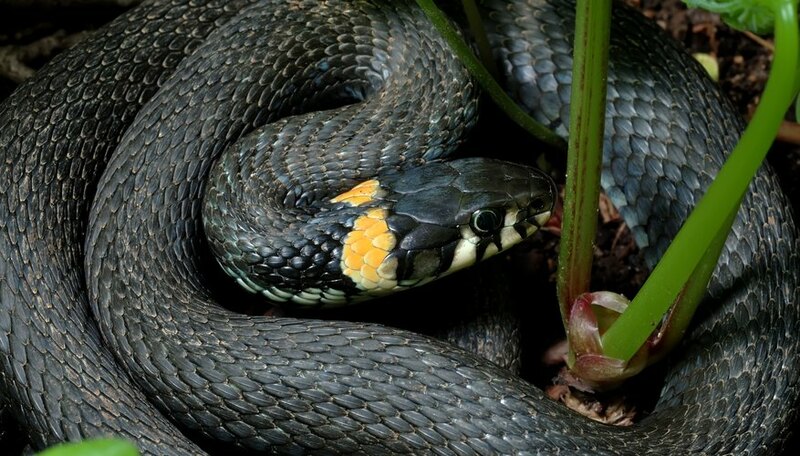 More than 40 species of snakes inhabit the state, several of which are black with yellow rings. 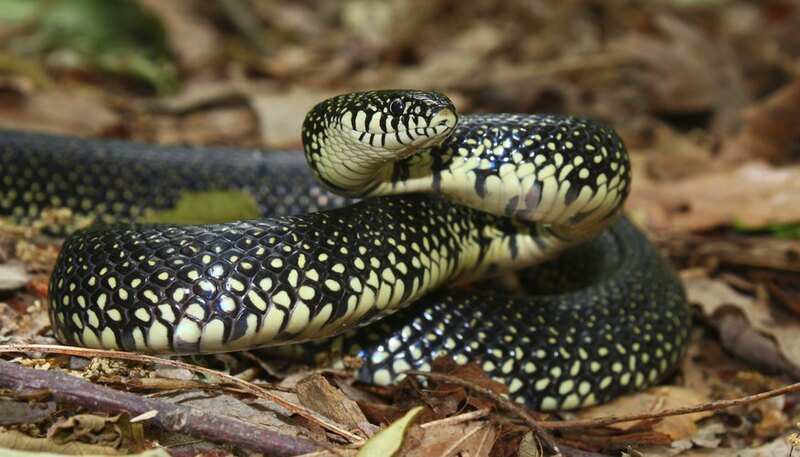 Some species have yellow rings to warn potential predators of their venomous bite, but not every yellow and black snake is poisonous. Rinkneck snakes (Diadophis punctatus) are small snakes found throughout Georgia. Mature snakes grow to 10 to 15 inches long and feed primarily on small insects, worms, slugs, small amphibians and other snakes. 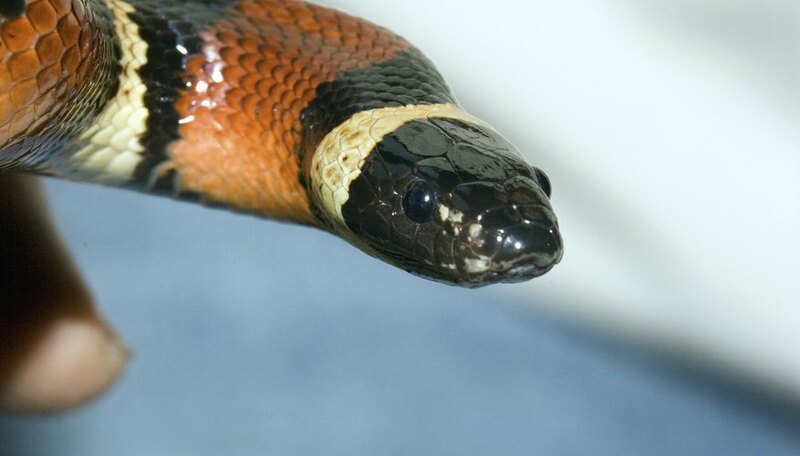 As their name suggests, ringneck snakes have a conspicuous yellow ring just behind their head. 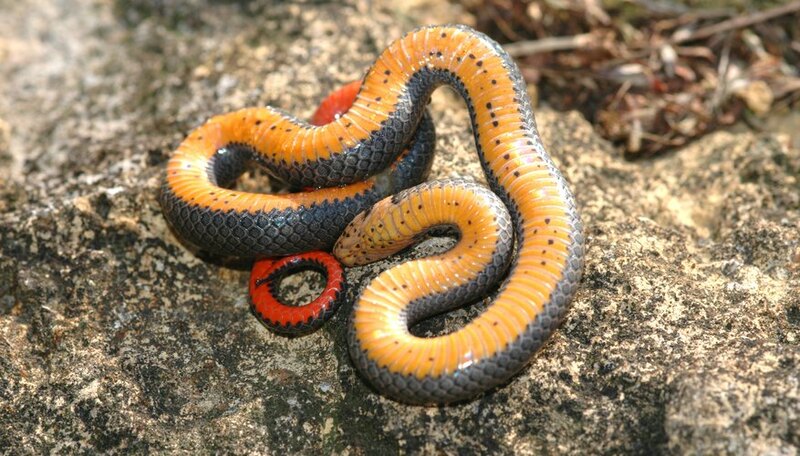 The base color of the snake ranges from light gray to solid black, but all ringneck snakes have a bright yellow underside. When threatened, ringneck snakes display the bright coloration on their bellies in hopes of scaring off potential predators. The Eastern kingsnake is a large, solid black snake with multiple narrow yellow rings around its body. Eastern kingsnakes grow between 3 and 4 feet long and vary in appearance throughout Georgia. Kingsnakes found in the northern portions of the state are often solid black or have faint speckled yellow bands, while snakes found in the south along the coastal plain often have distinct, wide yellow bands, according to the University of Georgia. Eastern kingsnakes are highly beneficial snakes because they feed on pit vipers such as copperheads and rattlesnakes. The yellow bands create an optical illusion when the snake moves quickly along the ground that confuses predators. The Eastern coral snake (Micrurus fulvius) is the most venomous snake in North America and is found only in the southern portions of Georgia. Coral snakes inhabit the pine and sand oak forests near the Florida boarder and along the Gulf Coast. Coral snakes, about the size of a common garter snake, can grow up to 4 feet long and have bright yellow and red bands over their black body. The red bands are always flanked by yellow bands on each side. Coral snakes feed on other snakes and lizards. The snakes do not constrict their prey but instead inject a potent neurotoxin using two fangs located in the rear of their mouths. Scarlet snakes are brightly colored and resemble the venomous coral snake. Scarlet snakes, however, are harmless and pose no threat to humans. 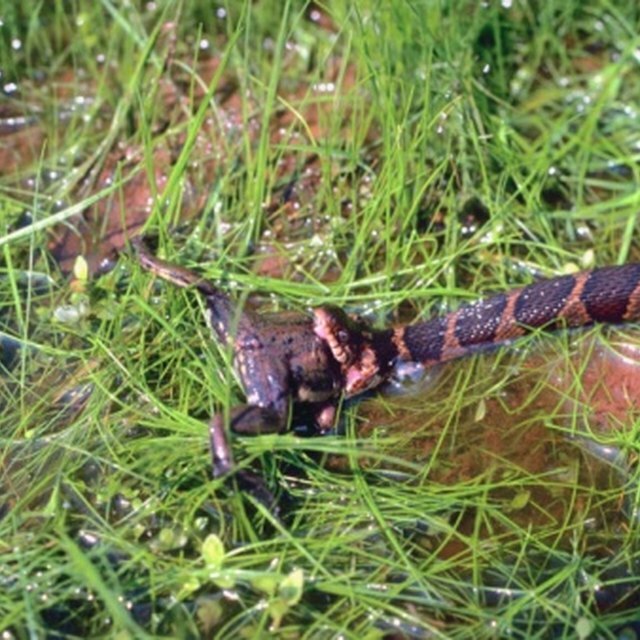 The small snakes only grow 2 feet long and have a bright yellow and red pattern on a black body. The proportion of colors on scarlet snakes varies greatly from animal to animal and some are more red than others. Scarlet snakes are found everywhere in Georgia except the highest mountains in the north. They feed on a wide variety of foods including bird eggs, other snakes, lizards and small rodents. 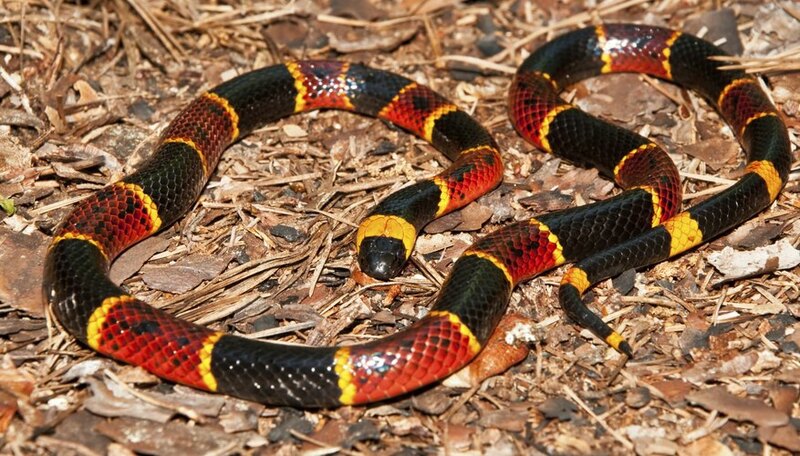 Though they resemble the coral snake, their red bands are always bordered by black, not yellow. Campbell, Damien. "Black Snakes with Yellow Rings in Georgia." Sciencing, https://sciencing.com/black-snakes-yellow-rings-georgia-8451969.html. 03 August 2018.